Yesterday we look backwards on the Cloud by Remembering where vCloud all began, in Paul Maritz's speech at VMworld 2008. So today, we take a quick look at where its going, especially as I have not had a chance to write up any of my thoughts on Zimbra since pondering it before the announcement. The latest information comes from the VMware earnings call held just a few days ago on Jan 25th. The transcript is available care of Seeking Alpha. The elements which relate to vCloud are below. The first is by Tod Nielsen, Chief Operating Officer at the end of his opening remarks, where he concludes with. The task in 2010 is to build on our leadership position within the most important software category CIOs are investing in today while helping our customers along their journey to cloud computing. In Paul Maritz remarks a large portion of the time is spend discussing Cloud. Specifically, this year we plan to strengthen and widen our value proposition to what is being called the private cloud enabling our customers to get further utilization and automation out of their x86 related compute, storage, security and networking resources enabling them to operate and relate to their own customers as though they were an internal service provider. In doing so, customers will also be preparing themselves to be able to reach out in to the public cloud and to take advantage of compatible infrastructure and management being offered by our public vCloud partners when and if it makes sense for them to do so. We’ll also be investing in strengthening our desktop virtualization offerings as Tod said which will enable customers to get further value from this internal or private cloud. In parallel to providing our customers with the path forward for their existing datacenters, there’s a complementary opportunity to guide application development in middle ware to fully benefit from the underlying infrastructure and to offer complete new services that sit on top of that infrastructure. You saw us make a big investment in this regard last year with the acquisition of SpringSource. After one full quarter of operating together we are even more convinced of the potential of integration and innovation. While keeping and enhancing Spring as an open framework targeting multiple environments, we expect to see new products that specifically integrate Spring and vSphere appear in 2010. We are now in the process of taking another complementary move with the acquisition of Zimbra. We believe that Zimbra has the right underpinnings to be offered as a scalable solution either on premise or through our service provider partners as a cloud based solution. Upon closing, this will represent a big step forward in being able to offer complete services that sit on top of VMware infrastructure be it in the private or the public cloud. From a financial point of view as Mark noted, we’re continuing to manage the company conservatively keeping a close eye on costs and aiming at all times to maintain healthy margins. You can see some of the results of the cost containments and the efficiency actions we took in our 2009 results and I would again like to thank our employees who contribute to these efforts. We intend to keep the balling moving forward at all times in terms of investing for the future. We intend to be one of the major beneficiaries of the coming shift towards new computing architectures that will allow greater efficiency and simplicity both inside and outside the datacenter. Now, with that we’ll open up for questions. So what can we glean from this? Some thoughts. In 2008 VMware were talking about "application workloads" and "vApps" which were essentially just containers for servers. The fear was the requirement to rewrite applications to be usable on the Cloud. I think many in the Infrastructure space (VMware's existing customer base) focused on this server focus. Yet there was the key phrase in the speech, the workloads of today and tomorrow. "How do I take my collection of infrastructure resources and increasingly see them as a single giant computer on which I can flexibly run both todays application workloads and tomorrows application loads." How could we forget Maritzs love for Ruby. However I think a lot of us were still thinking very server workload centric, whilst VMware with a CEO with such a background in software development has seen that delivering infrastructure to run server workloads, whilst significant, is going to be a reducing market as software architectures change. The money is to be found where the future spending is going, leaning more to new initiatives rather than keeping the legacy going (server virtualisation is about cost recovery and containment). In 2009 we see VMware get into SpringSource, the first big play into this application framework and PaaS space. If those applications are going to be rewritten for the Cloud and move away from the server workload models then VMware want in. From the report above we can see that "After one full quarter of operating together we are even more convinced of the potential of integration and innovation. While keeping and enhancing Spring as an open framework targeting multiple environments, we expect to see new products that specifically integrate Spring and vSphere appear in 2010." In 2010 we see VMware get into Zimbra, the first big play into the actual application space. So is VMware going to complete the stack with actual applications. Certainly stack building is becoming bit of a range in the industry at the moment. Is this why they purchased Zimbra? There was a question asked on the call about Zimbra and Maritz stated "We see Zimbra as both an opportunity and a strategic move because this will allow us to show how our underlying infrastructure will handle workloads at any level of scale and provide a readymade solution that both our own channels and our service provider channels can take to market." then combine this with the term "complementary move" which was quoted previously. The outcome? I think VMware picked up a good opportunity and a great use case for their growing stack. If you are going to convince everyone to take on your Cloud stack (vSphere, vCloud, SpringSource) then its great to have a great use case to work things out on and then showcase. This is exactly what VMware parent EMC say they are doing with some of their services, as Chad Sakac stated "EMC has stood up our compute and cloud storage services to act as a PROOF POINT of the end-to-end technology, not to compete with the service providers/telcos." Remember that Zimbra is built on top of Tomcat and Java (a great match with Spring). When you review the Zimbra architecture its just waiting for all that glue, middleware and scaling that VMware have been talking about (the end of Steve Herrods VMworld 2009 Keynote comes to mind). So how can we end before this turns into the length of a Chuck Hollis post? Don't get to excited about VMware purchasing Zimbra, it is not the start of an avalanche. Expect some big delivery on the vCloud this year (after talking it up since 2008) and some first release integration of SpringSource, vSphere and vCloud as well. Expect little change or movement on Zimbra before 2011. 2010 will be the delivery of the promised meat and potatoes for Cloud and VMware, 2011 should see lots of spice added to the pot with some vigorous stirring as the stack fleshes out the base of 2010. On September 15th, 2008 at the Venetian Hotel in Las Vegas, Paul Maritz walked on stage for his first VMworld. It had only been just over 8 weeks since the press release came out (July 8) announcing the immediate replacement of the founding CEO Diane Green by Martiz. The crowd was eager to see what the new leadership was made of and where the company was heading. What was this ex Microsoft executive going to do with "our beloved VMware", for many people view the company as a family. The keynote was the first announcement of the vCloud Initiative. Some might say a new direction for VMware, others a natural evolution. It is very interesting to look back to the very start of vCloud and see the companies thinking given the knowledge we have today. A few things have happened since that date, the purchase of SpringSource and Zimbra, the launch (and some might say fizzle) of vCloud Express, the vCloud API being published and submitted to the DMTF. Now that it is 2010, its a good time to go back to the beginning, and see the vision, one of the first pushes from the new CEO, that started the vCloud journey. What follows is a transcript of vCloud elements (introduction and body) of the VMworld Keynote, Sept 15 2008, Paul Maritz, President and CEO VMWare. We are moving fundamentally away from a device centric world, to a world that is application, information and people centric. We are all about how do we take infrastructure and treat that infrastructure as a common substrate on which we can build experiences that allow services to be provisioned ultimately to users in a much more flexible way without having to redo the underlying infrastructure. And allow us to gang together all the underling elements of that infrastructure to increasingly think of that infrastructure as a single giant computer of which applications and services can be fundamentally provisioned in a more manageable, scalable and extensible way. When we divide this challenge up we split it into three themes, the Virtual Datacenter Operating System, the vCloud Initiative and the vClient Initiative, the three Vs.
We are responding to is basically the following needs. On the one hand we see our current corporate IT customers under a mandate, particularly in this economic climate, to use the underlying compute resources they have in a fundamentally more efficient and flexible way. To be able to start behaving internally like a hosting provider or like an Internal Cloud, or reaching for the self service datacenter or reaching for utility computing or reaching for autonomic computing, they are all phrases that mean the same thing. How do I take my collection of infrastructure resources and increasingly see them as a single giant computer on which I can flexibly both todays application workloads and tomorrows application loads. The next thing is how do you look outside and realise that there are increasing numbers of people who are building compute resources in their datacenters, in their publicly accessible datacenters, how do you take advantage of that? How do you think about that as part of your strategy. And our vCloud Initiative speaks to this. We want the flexibility to allow you to start having much more freedom about where you pull your compute resources from. 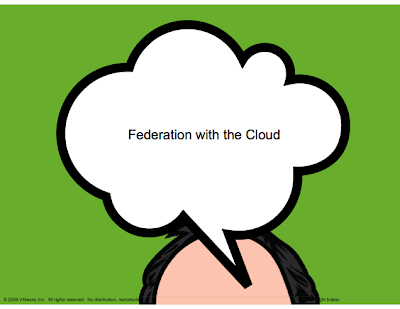 There is tremendous discussion in the industry today about the Cloud and we believe that the key point here is not about an either an, do you do it all internally or do you drop everything and try and do everything externally, its all really about flexibility and federation. So the needs to look at the cloud are real. All of you are being asked to do things more quickly, more cost effectively, you need to look very hard if you want to cary capital expense on your books or have the capital expense carried on someone else’s books. So there is a tremendous interest and a genuine need to look at what can be done with off premise computing resources but it comes with real problems. Generally these external clouds are not compatible with what we find inside the enterprise environment today. A lot of their infrastructures, the way that they have approached things, requires you to essentially write new applications. And on top of that they are all different. So how do you make the decision basically which guy you are going to use, are you going to get locked into them, do you have to rewrite your application etc. We think we can use the techniques we are using today to basically isolate application loads from underlying infrastructure inside the datacenter and apply those basic approaches to the cloud as well. So we are working on an initiative to be called the vCloud Initiative. Which starts with that extended definition of an application load that I talked about earlier, the virtual appliance going to the virtual application or vApp standard that allows you as a IT organisation to understand when you have got your application load thats in a form that is well described, isolated enough, well formed enough, to be able to hand that to someone else and have them run it in their infrastructure. Conversely, it is a set of standards and a vocabulary that will allow cloud vendors to speak to you in terms of what application loads they can accept and run in their environment. And the hope is here and the intent is here that that will allow IT organisations and cloud operators to be able to talk in meaningful terms to each other and it does not become an either or situation, it becomes a situation where you can make flexible decisions about which parts of your application loads you want to run internally or externally and change your mind as the time goes by. And clearly we have received a tremendous amount of interest in this area. We have over a 100 cloud operators who have signed on to be part of this vCloud Initiative including some big names like Verizon and British Telecom and Sungard and Savvis and T Systems etc. So they will be working with us to be able to articulate to you what kind of services they can provide to you and conversely you can understand how to get yourself and your applications into a position to be able to take advantage of that. So we will be extending our Virtual Datacenter Operating System to not only have infrastructure services, application services, but have a set of services that have to do with federation, what we call our Cloud vServices, that will allow you to now federate across and distribute your application load across both, resources inside the firewall and resources outside the firewall. Sometimes it can be revealing to see the start of a multi-year initiative how much it has stood the test of time. It was such a time ago many people may not have even heard the initial vision that Martiz revealed. I certainly think if you really want to understand vCloud in all its current forms, its helpful to view the seed that it has all germinated from.